Burger King is tweeting back at Kanye West, after the rapper showed some very public love to McDonald's. The controversial rapper declared McDonald's his favourite restaurant via Twitter on Sunday (November 4), and the fast-food chain's rival Burger King didn't appreciate the slight. The U.K. division of Burger King retweeted West, adding, "Explains a lot." The North American Burger King piped up soon after, declaring, "eyes still closed I guess" — referencing West's recent eye-opening revelation that it was time for him to back down from political commentary. It's not the first time that West made his appreciation for McDonald's known, though. 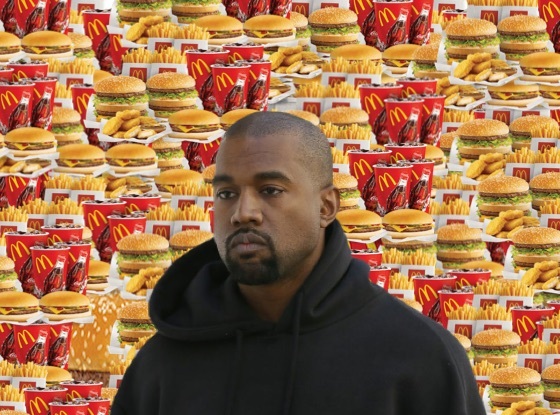 In 2016, he wrote a poem called "The McDonald's Man" about the burger chain (and their totally suspect fries), which appeared in Frank Ocean's Boys Don't Cry magazine.